I’ve been arguing that margins are likely to remain high because I expect companies to continue to be cautious about expanding their capacity and payrolls. However, I am becoming concerned that deflationary forces (more competition and more technology) could depress margins from the top down. Needless to say, the record high in the profit margin is bound to continue to inflame the income inequality crowd. During Q4-2013, wages and salaries in compensation accounted for just 48.9% of national income, the lowest share on record. Total compensation (including supplements) fell to 60.7% of national income, the lowest since Q4-1951. Of course, the data are pre-tax and before social benefits, which significantly reduce income inequality. Yesterday, I noted that the recent decline in the so-called “momentum” stocks--particularly in the S&P 500 Biotechnology, Internet Retailing, and Internet Software & Services industries--has raised fears that this might signal a market top. I noted that the S&P 500 remains near record territory despite the weakness in these stocks and that investors may simply be rotating into stocks with lower valuation multiples. I noted that Financials seem to be benefitting from this internal correction. Yesterday afternoon, we learned that the Fed rejected the capital plans of five large banks and approved 25 as part of its annual stress tests. Companies must pass the test to receive approval to pay more dividends and to buy back shares. The results set the stage for several banks to do just that after years of restraint following the financial crisis. The S&P 500 Bank Composite Index is up 6.9% ytd, and should continue moving higher. Also benefitting from the correction in the momentum stocks are the mature tech stocks that had been the high-flyers during the tech boom of the 1990s. The S&P 500 Systems Software stock price index (CA MSFT ORCL RHT SYMC) is up 3.6% ytd to a new bull market high and only 21.5% below its March 23, 2000 all-time high. Back then, the forward P/E of this industry was 49.4. Now it is 13.4. Back then, industry analysts predicted long-term annual earnings growth of over 25%. Now they are projecting 9%. The S&P 500 Biotechnology stock price index (ALXN AMGN BIIB CELG GILD REGN VRTX) peaked at a record high on February 24. It is down 10.5% since then through yesterday’s close. It is still up 208% from its 2011 trough, when the forward P/E fell to 10. This valuation multiple is now 22.0. Driving valuations higher in the industry since mid-2011 has been an amazing increase in industry analysts' expectations for short-term and long-term earnings growth. The former has tripled to over 30%, while the latter has doubled to almost 25%. The recent correction in Biotechs was triggered by concerns that the government will pressure the industry to reduce the prices of some of its higher-priced products. Also providing a bit of lift to stocks yesterday morning was Markit’s latest batch of flash M-PMIs. The US manufacturing index edged down from 57.1 during February to 55.5 during March, but remained solidly above 50.0. Both the output and orders component indexes remained strong at 57.5 and 58.0. Stocks also rose yesterday morning despite continued weakness in China’s flash M-PMI. It fell from 48.5 in February to 48.1 in March, an eight-month low. It has declined for the past five months from a recent peak of 50.9 during October. The output component was even weaker, falling from 48.8 last month to 47.3 this month. That’s an 18-month low. Apparently, investors believe that bad news is good news in China since the government is likely to scramble to stimulate more growth. 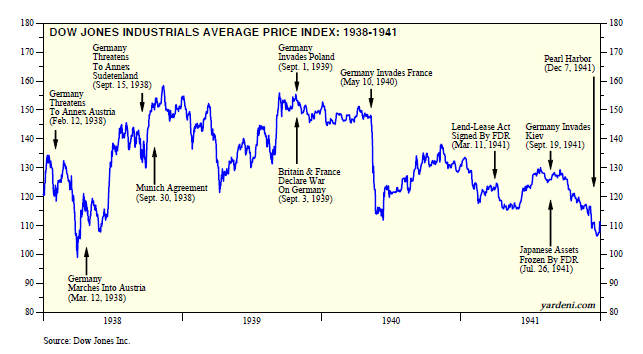 Earlier this year, the bears noted that the DJIA might be following the 1928-1930 Great Crash script. Fortunately, it hasn’t play out that way so far. Now the bears are focusing on 1938-1939, when Hitler invaded Austria, Czechoslovakia, and Poland. The concern is that current geopolitical developments are eerily reminiscent of that period. I noted a week ago that in October 1938, Hitler marched unopposed into Sudetenland a month after Britain and France gave him this territory that was part of Czechoslovakia. The Sudeten Nazi Party had set the stage for this annexation by instigating strikes and riots, which were shown in German newsreels as evidence of Czech atrocities against German-speaking Sudetens. Hitler threatened war unless he was appeased, which he was at the infamous meeting in Munich. Putin seems to be following the same script in the Ukraine. Nevertheless, the S&P 500 rose to a new intra-day record high of 1883 on Friday before closing at 1866. It managed to gain 1.4% for the week, following the previous week’s 2.0% decline. That’s despite last Wednesday’s 0.6% decline in response to Fed Chair Yellen’s off-the-cuff statement that the Fed might start raising interest rates six months after QE is terminated probably by the end of the year. That would mean that rates will start rising around mid-2015. Stocks rebounded 0.6% the next day, Thursday, as investors realized that Yellen’s forward guidance depends on inflation rising back to 2% and the unemployment rate falling probably closer to 5.5%. That might take longer to happen than mid-2015. In any event, the Fed's latest “dot plot” showed that in the latest economic projections of the FOMC’s participants, the federal funds rate is expected to be just 1.0% at the end of 2015, hardly an impediment to higher stock prices. So far, the stock market is continuing to follow a bull market script similar to the bull markets that started in 1982 and in 1990. That’s mostly because forward earnings for the S&P 500/400/600 continue to rise to record highs. Stock investors have learned over the years to either ignore geopolitical crises or use them as buying opportunities. It seems to me that we may need to reassess the geopolitical risks and their possibly adverse impact on stocks. Previously, I’ve shown the forward P/E of the S&P 500 on a monthly basis since Jimmy Carter was in the White House. There are lots of valuation models, but It’s easy to see that when the US became the sole superpower during the 1980s and 1990s, the P/E trended higher. During the previous decade, the US increasingly lost some its international stature, and the P/E trended downwards. The jury is out on where we go from here now that the P/E is the highest since June 2007. It may very well depend on geopolitical factors again. So far, the stock market doesn’t seem to be giving much if any weight to rising geopolitical risks. During the current bull market, valuations have been driven mostly by perceptions of financial risks. That’s understandable given the Trauma of 2008. The forward P/Es of the S&P 500/400/600 rebounded dramatically at the start of the bull market as investors bet that the Fed’s ultra-easy monetary policy, FDIC guarantees for new bank debt, and the suspension of mark-to-market would end the financial crisis and revive the economy. They tumbled during the spring of 2010 as the Eurozone seemed to be heading for disintegration. They recovered over the rest of the year on hopes that wouldn’t happen. The P/Es plunged during the summer of 2011 on renewed fears of a Eurozone meltdown and on the downgrade of US Treasury debt. Since then, the forward P/Es of the S&P 500/400/600 are up 46%, 43%, and 50% to 15.2, 17.4, and 19.2. In a melt-up scenario, they could go higher. Right now, uncertainty about Yellenomics and geopolitics might put a lid on them. There’s not much inflation in OECD consumer price indexes. The CPI inflation rate for this group of 34 advanced economies was just 1.6% y/y in January. It’s been hovering in a 1.0%-2.0% range since the start of 2010. The Eurozone’s CPI inflation rate is especially low at 0.7% during February. In the US, the CPI inflation rate was just 1.1% last month. The core rate (excluding food and energy) was higher at 1.6%. However, that’s the lowest since June 2013's two-year low, and the twelfth month in a row of readings below 2.0%. Why does inflation remain so low despite the recovery of the global economy over the past several years? Keynesian economists believe there is too much slack in the US economy and other economies as well. They believe that fiscal and monetary policies must stimulate more demand. I’ve argued that there may simply be too much competition in global markets. That implies that there may be too much supply as producers have had ample availability of cheap credit to expand capacity and to use new technologies to increase productivity. While most macroeconomists believe that easy money is always inflationary, it hasn’t proven to be so in recent years. Hence, my contrarian view that easy money can be deflationary by enabling the expansion of supply. Technological innovation also tends to boost supplies by boosting productivity. In the past, rising productivity lifted the real purchasing power of workers. As they spent more, employment would also increase. In recent years, there seems to be a widening divergence between productivity and both real compensation and employment. The result of these divergences may be an excess supply of labor. In a competitive labor market, wages would fall and eliminate the excess supply. However, governments tend to intervene by raising minimum wages and by providing welfare benefits to the unemployed. So people drop out of the labor force. Wages don’t rise much because productivity is always increasing as technological innovations allow more to be produced with fewer workers. Previously, I demonstrated that the resource utilization rate--a measure of economic slack derived by averaging the capacity utilization rate and the employment rate--has a very low correlation with the CPI inflation rate. There’s a much better fit between this inflation rate and unit labor costs--hourly compensation divided by productivity. According to the article, the plan was ready about a year ago, but was delayed by “deep divisions between government departments and dissatisfaction from Li Keqiang, the Chinese premier, who has been a strong champion of the scheme.” Apparently, last week’s batch of weak economic indicators convinced the government that now is the time to go public with the stimulus plan. The China MSCI index is down 10.6% ytd in US dollar terms. Both industrial production and crude oil usage have flattened out over the past few months. Retail sales rose 11.8% y/y during February, the slowest since February 2011. The article also notes that while China’s central planners are committed to growth based on more consumption and less infrastructure spending, “they insist that they must keep investment levels high in the short term to guarantee employment and political stability.” I’ve made this point in the past. Transitioning from export-led growth to consumer-led growth is easier said than done, especially after 30+ years of the former. While Chinese officials are struggling to make the transition, they are likely to rely on the same old formulas to sustain growth. The problem is that debt was an important ingredient in the old formula, and it is no longer as stimulative as in the past. The latest central plan aims to increase urbanization from 54% of the population to 60% by 2020. Most developed countries are at around 80%. There are about 270 million migrant workers who are required to have hukou permits to work in the cities. They are not eligible to use any social services, including health, housing, education, or pensions in their new urban homes. This system will have to be dismantled over time to allow these workers to permanently urbanize. Japan’s Consumer Confidence Index jumped from 39.9 during December 2012 to 45.7 during May 2013 as the new government implemented Abenomics to boost economic growth. This index has been trending down since then, falling to 38.3 last month, the lowest reading since September 2011. The problem may be that while workers are likely to receive pay increases, they may not be sufficient to offset rising prices and April’s hike in the consumption tax. Abenomics succeeded in depreciating the yen early last year and boosting stock prices. However, the stimulative impact of this policy approach seems to be losing its effectiveness already. That’s partly because the plunging yen boosted import prices, depressing the purchasing power of Japanese consumers and businesses. Just as troublesome is that imports continue to outpace exports. Back in 1996, Japan’s economy was showing signs of recovering from the bursting of a major asset-price bubble in the early 1990s. After the Japanese government raised the consumption tax to 5% in April 1997, the economy sank into recession. The downturn would last for over a year and a half, enabling deflation to take root in Japan. As noted above, Japan’s government plans to raise consumption taxes in April of this year. (1) I much prefer the CRB raw industrials spot price index, which includes copper and 12 other commodities. Not surprisingly, the price of copper is highly correlated with the CRB index. However, the two have diverged over the past year, with copper down 18% since the start of 2013 while the CRB index barely changed. And it hasn’t dropped along with copper in recent days. That’s encouraging. (2) On the other hand, the recent drop in the price of copper is yet another signal of trouble for emerging markets. Previously, I’ve noted that the CRB index is highly correlated with the Emerging Markets MSCI. Well, the price of copper is even more highly correlated with the EM MSCI. (3) The same can be said for the China MSCI: The price of copper is also highly correlated with this index. Indeed, much of the recent weakness in the copper price is attributable to mounting signs of a slowdown in China, particularly the 24% plunge in the country’s exports during February. As I noted yesterday, much of that drop is likely an aberration related to the Lunar New Year. In addition, copper has often been used as collateral for borrowing money in China. The authorities seem to be clamping down on that practice, which might also explain why copper has been weaker than the CRB index over the past year. Keynesians tend to focus on the “slack” in the economy as measured by the “output gap” between potential and actual real GDP. Inflation tends to decline (increase) when there is too much (not enough) slack. Fed Chair Janet Yellen is a card-carrying Keynesian. Members of this club have been frustrated that ultra-easy monetary policy hasn’t boosted aggregate economic demand sufficiently to close the output gap and boost inflation. While lots of stimulus was provided by the American Recovery and Reinvestment Act during 2009 and 2010, they bemoan that there has been too much fiscal drag since then. They conclude that ultra-easy monetary policy must be maintained for as long as necessary to close the gap. I don’t track the output gap very closely, but I do monitor a monthly proxy for it, i.e., the resource utilization rate (RUR). It is simply the average of the capacity utilization rate and the employment rate, which is 100 minus the unemployment rate. RUR has increased from a low of 78.7% during June 2009 to 86.0% during January. Interestingly, the correlation between RUR and the core CPI inflation rate is actually quite low. The 24% free-fall in China’s exports during February to the lowest reading since February 2012 was so bad that it makes no sense. Although the data are seasonally adjusted, the Lunar New Year holiday most likely distorted the month’s data. Comparable, though less severe, declines occurred during February in both 2011 and 2012. On the other hand, German production and orders data showed solid gains during January. Both Italy and Spain also continued to show a recovering trend in production during the first month of the year. However, France continues to weigh on the Eurozone’s recovery. February’s M-PMIs suggest more of the same for all four of the region’s biggest economies. The Fed released its quarterly Flow of Funds report last Thursday. It showed that the market value of all equities traded in the US soared to a record $34.7 trillion at the end of last year, up a whopping $20.9 trillion since the start of the bull market during Q1-2009. Total stock market capitalization as a ratio of nominal GDP rose to 1.25 at the end of last year, exceeding the previous 2007 peak of 1.12 and the highest since Q3-2000. The price-to-sales ratio of the S&P 500 rose to 1.54 at the end of last year to the highest reading since Q1-2002. Tobin’s Q is another valuation metric that can be calculated using data in the Flow of Funds report. It is the ratio of the market value of equities to the net worth at market value of nonfinancial corporations. I adjust it by dividing it by the average ratio since the start of the data. It was 1.44 at the end of last year, the highest since Q2-2001. There are more hints of a melt-up in stock prices. That could be a more serious threat than any geopolitical blowup to my prediction that the secular bull market could run for another two years or longer. The forward valuation multiples of the S&P 500/400/600 are now at bull-market highs and slightly exceed the 2007 highs of the previous bull market. On Tuesday, the forward P/Es of the three S&P composites rose to 15.4, 17.7, and 19.1. Bullish sentiment has rebounded sharply during the past few weeks. The Bull/Bear Ratio compiled by Investors Intelligence fell from a recent high of 4.23 during the week of December 24 to 2.40 during the week of February 11. Over the past three weeks, it has bounced back to 3.62. The Bank of Japan has been injecting lots of liquidity into the financial system over the past year in an effort to stop deflation and raise the CPI inflation rate to 2% on a sustainable basis. January’s monetary base was up 56% y/y. So far, the BOJ can take credit for boosting the inflation rate to 1.4% during January from -0.9% last March. However, it did edge down over the past two months. The core CPI inflation rate (excluding food & energy) has been positive for the past four months through January, when it was 0.6%. That’s still awfully low, but it beats the 55 consecutive months of negative readings from January 2009 through July 2013. It wasn’t too long ago that the bears were predicting a financial meltdown in the Eurozone and the disintegration of this monetary union. The only meltdown currently underway in the Eurozone is occurring in bond yields. Spanish bond yields reached new historic lows last Friday as persistent expectations that the ECB will loosen monetary policy further supported lower-rated debt, even though inflation ticked up. Italian 10-year yields are at eight-year lows around 3.48%. Greek 10-year yields fell below 7% for the first time since April 2010, hitting levels seen just before Greece's EU/IMF bailout. The meltdown in yields is attributable to the meltdown in the Eurozone’s inflation rate, which is somewhat worrisome if it turns into deflation. On Friday, February's flash CPI for the region was up 0.8% y/y, unchanged from the month before. That’s well below the ECB's target of 2% and within the “danger zone” of below 1% as defined by the bank's president, Mario Draghi. This inflation rate was 2.7% two years ago and 1.8% a year ago. Yesterday, we learned that the Eurozone's M-PMI dipped from 54.0 during January to 53.2 last month. That’s still a solid reading. Germany's dipped but was at 54.8, and even Italy's (52.3) and Spain's (52.5) remained above 50. (1) Working-age population. Since November 2007, the working-age population is up 14.0 million, yet the labor force is up just 1.6 million. The number of people not in the labor force rose 12.4 million. The aging Baby Boomers are having a big impact on the age distribution of the working-age population. Since November 2007, the fastest-growing group is the 55- to 74-year-olds, up 12.6 million. The 35- to 54-year-olds group is down 3.5 million. (2) In the labor force. The weak 1.6 million increase in the labor force since November 2007 can be explained mostly by the loss of 4.9 million workers in the 35- to 54-year-old group, offset by a gain of 5.7 million in the 55- to 74-year-olds. (3) Not in the labor force. That older group tends to have a high labor force dropout rate due to retirements. Indeed, 6.7 million more of them were not in the labor force since November 2007 through January of this year.